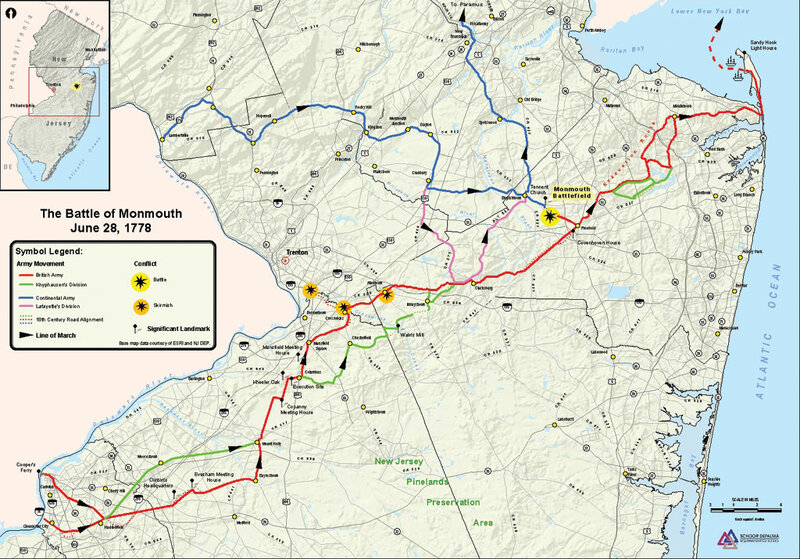 The Road to Monmouth Battlefield map displays information on Revolutionary War routes of soldiers, historical landmarks, 18th century roads, modern-day road networks, and new municipalities. George Washington and the Continental Army pursued British regulars across New Jersey following the British evacuation of Philadelphia in June 1778. Washington's intention was to prevent or substantially delay the British from reaching the coast of New Jersey before French war ships arrived in support of the American Revolution. On June 28, 1778, the pursuit ultimately led to the collision of the two armies one mile west of present-day State Highway 9. Today, the site of the battle is a peaceful 2,360-acre area of rolling hills, dense woods, and boggy marshes in Manalapan, New Jersey. On June 2829, 2003, the site again smelled of gunpowder, and sounds of cannon fire could be heard during the battle's 225th anniversary celebration conducted by the Friends of Monmouth Battlefield. The Friends of Monmouth Battlefield organization was founded in 1990 to historically protect, preserve, and research the history of the battlefield. This year, the organization's reenactment of the battle involved more than 2,000 people fully dressed in Revolutionary War period outfits and included a map that accurately displayed routes that Revolutionary War soldiers took on the way to the battle. In early 2003, the Friends of Monmouth Battlefield approached the firm Schoor DePalmabecause of a longtime friendship with company Chairman and CEO Stephen DePalmafor help in creating a map to be displayed at the 225-year anniversary celebration. In response to the Friends of Monmouth's request, James Mawbya GIS analyst at Schoor DePalma and a distant descendent of George Washingtonwas tasked with the responsibility of building the detailed map. 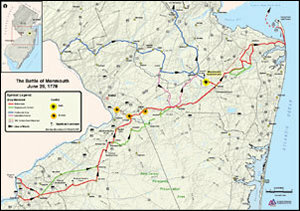 Through its use of GIS technology, Schoor DePalma combined centuries-old dataroutes of soldiers, historical landmarks, and 18th century roadswith modern-day informationcurrent road networks and new municipalitiesto create the first comprehensive map of the march to the Revolutionary War's Battle of Monmouth. ArcGIS Desktop 8.x software provided the tools necessary to give a new-world look to a 225-year-old Revolutionary War battle. Schoor DePalma selected ArcGIS Desktop 8.x because of the simple yet versatile thematic mapping capabilities of its ArcMap application. Once work started on the project, Schoor DePalma engineers and consultants met with the Friends of Monmouth to discuss map specifications. The Friends of Monmouth had previously deciphered the paths of Revolutionary War soldiers from disparate maps and journals of the time period. Combining Schoor DePalma's conversations with the Friends of Monmouth and GIS data provided by the New Jersey Department of Environmental Protection (NJDEP) and Esri, Mawby used ArcGIS to intertwine data sources into one detailed map. Layers that comprise the map include a landform basemap of New Jersey and its neighboring states; line and point historical information such as landmarks, routes of soldiers, and points of engagement; a modern-day road network; and a relief map showing hills and mountains. "The Friends had asked us to create a map that people in modern times could relate to and would still represent the march of soldiers 225 years ago," says Mawby. "The challenge was creating a map that met those needs without overloading the map with present-day road and route information." Using a New Jersey state mapwith routes highlighted by the Friends of MonmouthMawby scanned the hard-copy map and georeferenced the image in real-world coordinates (New Jersey State Plane, North America Datum 1983Feet, Horizontal Coordinate System) utilizing the georeferencing tools in ArcMap. The base landforms, town locations, and modern-day road network along the road to Monmouth were obtained from the Esri Data & Maps Media Kit. Mawby then constructed illustrations of specific troop movements, points of engagement, and significant landmarks to create the historical elements of the map. Draft reviews of the map produced comments from the Friends of Monmouth, in which Schoor DePalma was asked if high ground near Hopewell, New Jersey (known as the New Jersey Sourlands), could be displayed. This request produced one of the most interesting aspects of the mapand a technique that is frequently used in historical war mapswhich is the integration of a hillshading effect to show relief and elevations of mountains and hills. This aspect was extremely important because it helped the Friends of Monmouth illustrate George Washington's tactical war plans of mirroring British troop movements while staying out of sightand on opposite sides of the mountainsas the British made their way across New Jersey. The NJDEP Bureau of Geographic Information and Analysis provided a United States Geological Survey (USGS) 100-meter hillshade digital elevation model (DEM). "This project was made possible because of the GIS data provided by NJDEP, USGS, and Esri," says Mawby. "Without these data sources, we would have spent the majority of our time creating basemap featureslandforms, town locations, road networks, and water features. We were ultimately able to meet specific mapping requests of the Friends of Monmouth because of the technological advancements of the GIS software." "The Schoor DePalma corporate headquarters is very near Monmouth Battlefield, and many of our co-owners attended the anniversary celebration," says DePalma. "Our analysts were pleased to create this historical map because Schoor DePalma believes in giving back to our community and our heritage." The map is featured in a foldout brochure available at the Monmouth Battlefield State Park Visitor Center. A large format version of the map, which was displayed at Esri's 23rd Annual International User Conference in July 2003, is also displayed in the offices of the Friends of Monmouth Battlefield and the New Jersey Secretary of State Regena L. Thomas. "We were very impressed with the work that Schoor DePalma did on this historically accurate representation of the Battle of Monmouth," says Rich Walling, cochair of the Road to Monmouth Partnership and president of the Friends of Monmouth Battlefield. "The map received a wide array of praise from visitors at the battle's reenactment and will be seen by scores of battleground visitors for years to come." For more information, contact Robert Berardo, GIS department manager, Schoor DePalma (tel. : 732-577-9000, ext. 1433; e-mail: rberardo@schoordepalma.com) or James Mawby, GIS analyst, Schoor DePalma (tel. : 732-577-9000, ext. 1404; e-mail: jmawby@schoordepalma.com).